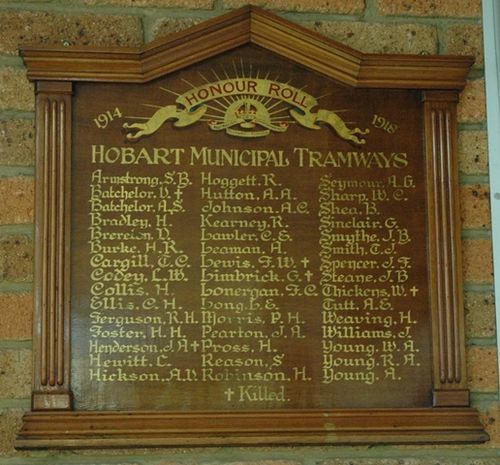 Honour roll commemorates the men from the Hobart Municipal Tramways who served in World War One. It lists 45 names. In the recreation room of the Tramway Offices, Hobart, on Sunday morning the engineer and manager of the Hobart tramways (Mr. S. H. Hancox) unveiled an honour roll, on which is inscribed the names of 45 men of the Hobart municipal tramways who enlisted in the Great War. 1914-1918. Mr. Hancox said that the war had brought out two characteristics, first, the A.I.F. was a volunteer force; secondly, it had produced a virile manhood second to none, and was the birth of a virile nation in Australia. The roll showed that 25 per cent of the tramways employees had enlisted for service, a record of which any industry should be proud. He asked those present to stand in silence for a minute to pay homage and respect to five of those who had made the supreme sacrifice. The Mercury (Hobart), 26th April 1933.